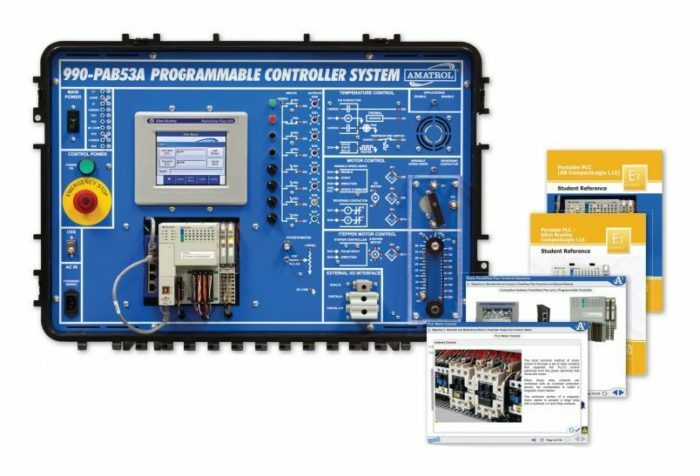 Amatrol’s Portable PLC Learning System – AB CompactLogix L16 (990-PAB53A) teaches programmable logic controller (PLC) programming, operation, and applications used throughout industry. Despite its compact, convenient size, this portable PLC training system features highly-interactive multimedia curriculum that teaches 90 skills across 14 different modules. The system provides hands-on experience with real-world components, including the powerful Allen-Bradley L16 CompactLogix 5300 PLC, a PanelView Plus terminal, an Ethernet Switch, an I/O Simulator, five application circuits, and a master control relay circuit. Learners will study industry-relevant applications that will build a strong foundation for a successful career in a variety of industries. The portable PLC training system includes application circuits and components for thermostatic temperature control, analog temperature control, reversing constant-speed motor control, variable speed motor control with feedback, and stepper motor homing and commissioning. These circuits include basic and advanced applications starting with discrete I/O projects and extending to projects involving analog I/O. These applications enhance a learner’s experience because they can actually see how a program controls real systems. Amatrol’s in-depth curriculum teaches a wide range of analog, discrete, data, and networking commands. Designed to teach modern PLCs as they are used today, the PanelView Plus terminal and networking are introduced in the basic lessons and applied throughout the curriculum. Learners cover a wide variety of program commands beyond timers and contacts, such as stepper motor, PWN, and analog control. This curriculum is presented in a highly-interactive, multimedia format that includes stunning 3D graphics and videos, voiceovers of all text, and interactive quizzes and exercises. Sample copies of the Portable PLC – Allen Bradley CompactLogix L16 and Portable PLC (AB CompactLogix L16) Student Reference Guides are also included with the system for your evaluation. Sourced from the system’s curriculum, the Student Reference Guides take the entire series’ technical content contained in the learning objectives and combine them into perfectly-bound books. Student Reference Guides supplement this course by providing condensed, inexpensive reference tools that learners will find invaluable once they finish their training, making them the perfect course takeaways. For those interested in PLC troubleshooting, Amatrol offers the Portable PLC Troubleshooting Learning System – AB CompactLogix L16 (990-PAB53AF) with FaultPro. FaultPro’s computer-based faults automatically track progress, enabling learners to gain troubleshooting skills in a self-paced environment that ensures that faults are inserted safely, protecting both learners and equipment. The troubleshooting system includes a variety of electronic faults that present realistic situations that technicians encounter on the job. This allows learners to develop important PLC troubleshooting skills, like PLC input and output testing, software testing, and application troubleshooting.